What is the Rhizosphere and how can understanding rhizosphere processes help feed the world and save the environment? This article will review the critical biogeochemical processes occurring at the plant root-soil interface. Soil is one of the last great scientific frontiers (Science, 11 June, 2004) and the rhizosphere is the most active portion of that frontier in which biogeochemical processes influence a host of landscape and global scale processes. A better understanding of these processes is critical for maintaining the health of the planet and feeding the organisms that live on it (Morrissey et al., 2004). There is a small but concerted effort under way to harness the root system of plants in an attempt to increase yield potentials of staple food crops in order to meet the projected doubling in global food demand in the next 50 years (Zhang, et al. 2010; Gewvin, 2010). These efforts are being done in the face of a changing global climate and increasing global population which will inevitably require more productively grown food, feed and fiber on less optimal (and often infertile) lands; a condition already encountered in many developing countries (Tilman, et al, 2002). Meeting the global challenges of climate change and population growth with a better understanding and control of rhizosphere processes will be one of the most important science frontiers of the next decade for which a diverse, interdisciplinary trained workforce will be required. In 1904 the German agronomist and plant physiologist Lorenz Hiltner first coined the term “rhizosphere” to describe the plant-root interface, a word originating in part from the Greek word “rhiza”, meaning root (Hiltner, 1904; Hartmann et al., 2008). Hiltner described the rhizosphere as the area around a plant root that is inhabited by a unique population of microorganisms influenced, he postulated, by the chemicals released from plant roots. In the years since, the rhizosphere definition has been refined to include three zones which are defined based on their relative proximity to, and thus influence from, the root (Figure 1). The endorhizosphere includes portions of the cortex and endodermis in which microbes and cations can occupy the “free space” between cells (apoplastic space). 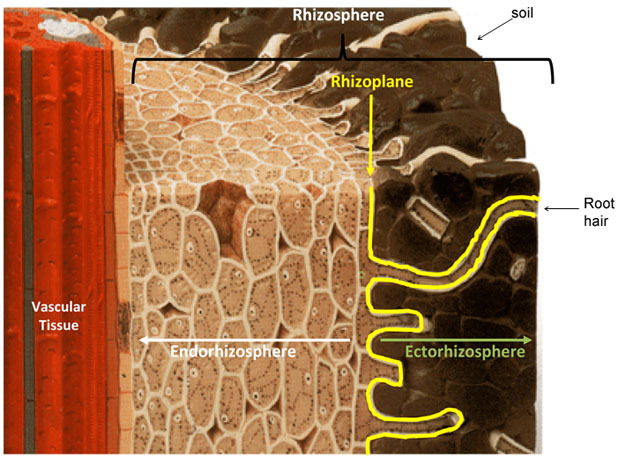 The rhizoplane is the medial zone directly adjacent to the root including the root epidermis and mucilage. The outermost zone is the ectorhizosphere which extends from the rhizoplane out into the bulk soil. As might be expected because of the inherent complexity and diversity of plant root systems (Figure 2), the rhizosphere is not a region of definable size or shape, but instead, consists of a gradient in chemical, biological and physical properties which change both radially and longitudinally along the root. 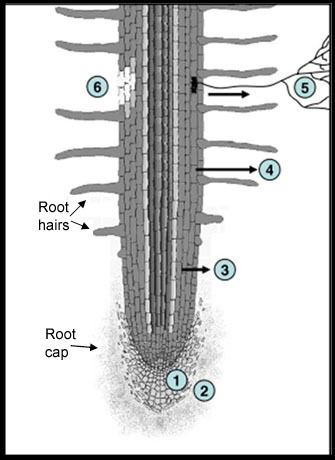 Schematic of a root section showing the structure of the rhizosphere. 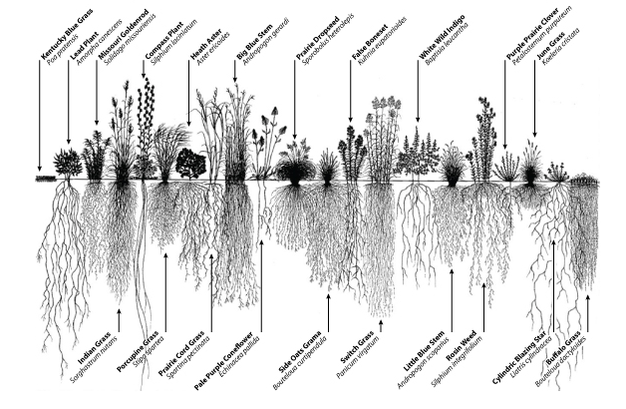 Image showing the diversity of root system architecture in prairie plants. © 2012 Nature Education 1995 Conservation Research Institute, Heidi Natura. All rights reserved. Newman (1985) examined a variety of plant species and estimated that roots can release anywhere from 10 to 250 mg C /g root produced or about 10-40% of their total photosynthetically fixed carbon. The C released is in both organic (e.g., low molecular weight organic acids) and inorganic (e.g., HCO3) forms, however, the organic forms are the most varied and can have the most influence on the chemical, physical and biological processes in the rhizosphere (Jones, et al., 2009). The composition and amount of the released compounds is influenced by many factors including plant type, climactic conditions, insect herbivory, nutrient deficiency or toxicity, and the chemical, physical and biological properties of the surrounding soil. The root products imparted to the surrounding soil are generally called rhizodeposits (Figure 3). Rhizodeposits have been classified based on their chemical composition, mode of release, or function but are classically defined (Rovaria, 1969) to include sloughed-off root cap and border cells, mucilage, and exudates. Schematic of a root showing the 6 major regions of rhizodeposits. 1 loss of cap and border cells, 2 loss of insoluble mucilage, 3 loss of soluble root exudates, 4 loss of volatile organic carbon, 5 loss of C to symbionts, 6 loss of C due to death and lysis of root epidermal and cortical cells. © 2012 Nature Education Jones, D.L., Nguyen, C., and Finlay, R.D. Carbon flow in the rhizosphere: carbon trading at the soil-root interface. Plant Soil 321:5-33 (2009). All rights reserved. Roots exert a tremendous amount of pressure (>7kg/cm2 or ~100 psi) at the growing root tips in order to push their way through the soil. Helping to lubricate and protect the root during growth, root cap and epidermal cells secrete mucilage, a viscous, high molecular weight, insoluble, polysaccharide-rich material. Beyond lubrication, the mucilage also provides protection from desiccation, assists in nutrient acquisition, and most notably binds soil particles together forming aggregates which improve soil quality by increasing water infiltration and aeration. Also serving to protect the root tip, cells lining and capping the root meristem are programmed to release (slough-off) which helps to reduce frictional forces that would otherwise damage the root (Bengough and McKenzie, 1997). Interestingly, the cells that are sloughed off continue to function and secrete mucilage for several days and have been shown to attract beneficial microorganisms, serve as “bait” for root pathogens, and sequester toxic metals (e.g. Al3+) (Hawes et al., 2000). Root exudates include both secretions (including mucilage) which are actively released from the root and diffusates which are passively released due to osmotic differences between soil solution and the cell, or lysates from autolysis of epidermal and cortical cells (Figure 4). The organic compounds released through these processes can be further divided into high and low molecular weight (HMW and LMW, respectively). By weight, the HMW compounds which are those complex molecules that are not easily used by microorganisms (e.g. mucilage, cellulose) make up the majority of C released from the root; however, the LMW compounds are more diverse and thus have a wider array of known or potential functions. The list of specific LMW compounds released from roots is very long, but can generally be categorized into organic acids, amino acids, proteins, sugar, phenolics and other secondary metabolites which are generally more easily used by microorganisms. The cocktail of chemicals released is influenced by plant species, edaphic and climactic conditions which together shape and are shaped by the microbial community within the rhizosphere. There is still very little known about the role that a majority of the LMW compounds play in influencing rhizosphere processes. A growing body of literature is beginning to lift the veil on the many functions of root exudates as a means of acquiring nutrients (e.g. acquisition of Fe and P), agents of invasiveness (i.e. allelopathy) or as chemical signals to attract symbiotic partners (chemotaxis) (e.g. rhizobia and legumes) or the promotion of beneficial microbial colonization on root surfaces (e.g. Bacillus subtilis, Pseudomonas florescence) (Bais, Park et al. 2004). A branch root (red arrow) of buckwheat (Fagopyron esculentum) frozen together with its surrounding soil and then imaged using scanning electron microscopy to reveal the intimate contact between the root and soil. Note the root hairs extending out and exploring the surrounding soil. Bar = 600 μm. b) Red arrows point to droplets of root exudates released from the tips of root hairs on the surface of broom corn (Sorghum sp.). Bar = 50 μm. © 2012 Nature Education McGully, M. The rhizosphere: the key functional unit in plant/soil/microbial interactions in the field. implications for the understanding of allelopathic effects. Division of Plant Industry. Forth World Congress on Allelopathy. The Regional Institute Ltd. All rights reserved. Plants respond to nutrient deficiency by altering root morphology, recruiting the help of microorganisms and changing the chemical environment of the rhizosphere. Components in root exudates assist plants in accessing nutrients by acidifying or changing the redox conditions within the rhizosphere or directly chelating with the nutrient. Exudates can liberate nutrients via dissolution of insoluble mineral phases or desorption from clay minerals or organic matter where they are released into soil solution and can then be taken up by the plant. The nutrients most limiting to plant growth are nitrogen and phosphorus. Even thought 78% of the Earth’s atmosphere is composed of nitrogen (N2 gas), it is in a form that is only utilizable by nitrogen-fixing organisms. As such, inorganic forms of N (NO3–,NH4+) that can be used by plants are added to soils. The availability of nitrogen in most soils is low because of the leaching losses of soluble nitrate (NO3–) with infiltrating rainwater, fixation of ammonium (NH4+) in clays and soil organic matter and bacterial denitrification. Plants respond differently depending on the form of nitrogen in the soil. Ammonium has a positive charge, and thus the plant expels one proton (H+) for every NH4+ taken up resulting in a reduction in rhizosphere pH. When supplied with NO3–, the opposite can occur where the plant releases bicarbonate (HCO3–) which increases rhizosphere pH. These changes in pH can influence the availability of other plant essential micronutrients (e.g., Zn, Ca, Mg). Phosphate (PO43-), the form of P used by plants, is highly insoluble in soils, binding strongly to Ca, Al and Fe oxide, and soil organic matter rendering much of the P unavailable to plants. Under P deficiency, plants have evolved special mechanisms to obtain PO43- which depend on plant type (dicot vs. monocot), species and genotype. Plant roots can exude organic acids such as malic and citric acids into the rhizosphere which effectively reduced rhizosphere pH and solubilize P bound in soil minerals. Pigeon pea uses another mechanism by releasing piscidic acid in response to P deficiency which chelates Fe in FePO4, releasing the PO43- (Raghothama, 1999). Plants also liberate PO43- from organic sources by releasing enzymes such as acid phosphatase. Iron deficiency elicits a response from plants which generally differs depending on whether the plant is a dicot or monocot. Dicots respond to Fe deficiency by releasing protons into the soil environment and increasing the reducing capacity of the rhizodermal cells. In monocots, Fe deficiency triggers the release of phytosiderophores such as mugienic acid which is a non-proteinogenic amino acid with extremely high affinity for Fe. The phytosiderophore chelates strongly with Fe and is then brought back to the root via diffusion where plasma membrane transporters specific to the chelated Fe shuttle it into the cells. Plants using the former method of Fe acquisition are called Strategy I and those using the latter Strategy II. Rhizodeposits make the rhizosphere a desirable niche for microbial communities to proliferate. One teaspoon of bare or tilled soil contains more microorganisms than there are people on Earth, however, the rhizosphere can have 1000-2000 times that number (1010-1012 cells per gram rhizosphere soil) making it a pretty crowded place. Nutrient availability for microbial growth is higher in the rhizosphere compared to the bulk soil; however, many microbes are competing for these nutrients, some more successfully than others. The plant rhizosphere -microbe relationships that have received the most attention include those of Rhizobia bacteria and their symbiotic plant partners, mychorrhizal fungi associations, and beneficial plant growth promoting rhizobacteria (PGPR) each of which will be discussed in more detail below. The observation that including leguminous plants in crop rotations results in better yields of non-legumes goes back many centuries to the Romans and Greeks. It was not until 1888, however, that Hellriegel and Wilfarth (1888) definitively proved that the cause of the improved yield was from the conversion of atmospheric dinitrogen (N2(g)) into ammonia, a form usable by the plant, by rhizobium bacteria (Rhizobium leguminosarum) housed within nodules on the roots of leguminous plants (Hirsch, et al., 2001)(Figure 5a). This discovery inspired Lorenz Hiltner who spent his career researching and developing rhizobial inoculants to improve agricultural productivity eventually leading to his development of the Rhizosphere concept. The interaction between rhizobia and legumes has been exhaustively studied since that time, elucidating several facets of the interaction. What we have learned is that the dialogue between the rhizobium and the plant begins first with a chemical signal (flavonoid) released when the plant is under N starved conditions. The flavonoid signal induces nodulation genes (nod genes) in the rhizobia which encode enzymes necessary to produce a chemical response (lipochitooligosaccharide) to the plant known as a nod factor. The nod factors initiate a cascade of developmental processes in the plant root which allow for the invasion of the bacteria and formation of the nodule in which the bacteria are eventually housed (Jones et al., 2007). The structure of the nod factors are largely species specific and are one of the reasons for the host specificity observed between rhizobia and their plant partners (Oldroyd and Downie, 2008). This specificity is quite astonishing considering that one gram of soil (about the size of a raisin) contains >109 bacteria from 10,000 different species, from which a miniscule amount have developed the ability to symbiotically cohabitate with plants. a) Nitrogen fixing nodules growing on the roots of Medicago italica; b) A corn plant root colonized with mycorrhizal fungi. The round bodies are the fungal spores and the hair like structures the hyphodium (white arrow); c) The beneficial plant growth promoting bacteria Bascillus subtilis (green) forming a biofilm on the surface of an Arabidopsis thaliana root (red). Creative Commons (a) By Matthew Crook, CC-BY-SA, see link at left. (b) Sara Wright/Courtesy of U.S. Department of Agriculture. (c) Rudrappa, T., et al. Root-Secreted Malic Acid Recruits Beneficial Soil Bacteria. Plant Physiology 148, 1547-1556. (2008). All rights reserved. Mycorrhizae (from the Greek words for fungus and root) is a general term describing a symbiotic relationship between a soil fungus and plant root. Unlike rhizobia and their legume partners, mycorrhizal associations are ubiquitous and relatively nonselective, occurring in ~80% of angiosperms and in all gymnosperms (Wilcox, 1991). The ability for plants to form symbiotic associations with mycorrhizae occurred early in the evolution of plants (~450 million years ago) compared to legumes (~60 million years ago), which is likely why mycorrhizae are now ubiquitous throughout the plant kingdom. Although parasitic and neutral relations exist, a majority of these associations are beneficial both to the host plant and the colonizing fungi. Mycorrhiza assist plants in obtaining water, phosphorus and other micronutrients (e.g., Zn and Cu) from the soil and in return receive sustenance (carbon) from the plant.There are two broad categories of mycorrhizal associations with plant roots, ectomycorrhiza and endomycorrhiza, which are differentiated by how they physically interface with the plant (Figure 6). The ectomycorrhizae (EM) occur mainly in the roots of woody plants (i.e. forest trees) and form a dense hyphal covering (fungal sheath or mantel) over the root tip from which hyphae grow into the intercellular spaces forming a net (Hartig net) of hyphae around the root cortex cells, but do not penetrate the cell walls. In contrast, the endomycorrhizae fungal hyphae grow into the root cortex and enter the cells forming fan-like, highly branched structure known as an arbuscule that remain separated from the cytoplasm by the plant plasma membrane (Harrison, 2005). The endomycorrhiza can be further divided into the more widespread arbuscular mycorrhiza (AM) and the specialized orchid and ericoid mycorrhizas which, as the name implies, are colonizers of orchids and ericoid (e.g., cranberry) plant species. The AM fungal associations are the most abundant of all mycorrhizal associations. In both cases, the Hartig net and the arbuscules increase the contact area between the fungus and the plant through which the transfer of nutrients to the plant and carbon to the fungus occurs. Unlike the ectomycorrhiza, the endomycorrhiza are wholly dependent on the plant for their carbon and when associations occur, both endomycorrhiza and ectomycorrhiza can demand up to 20-40% of the total photosynthetically fixed carbon the plant produces. 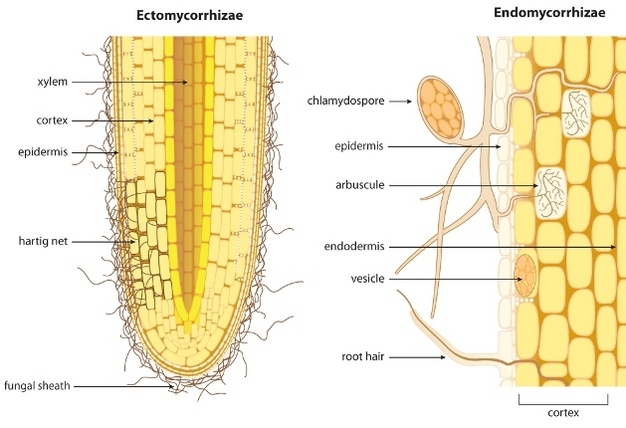 Schematic showing the difference between ectomycorrhizae and endomycorrhizae colonization of plant roots. © 2013 Nature Education Bonfante, P. & Genre, A. Mechanisms underlying beneficial plant-fungus interactions in mycorrhizal symbiosis. Nature communications 1 doi:10.1038/ncomms1046. All rights reserved. The chemical dialogue that initiates mycorrhizal associations with plants is intricate and not as well understood as that of the Rhizobia. In part, the lack of understanding rests in the fact that endomycorrhiza are obligate symbionts, meaning they cannot be grown independent of their plant hosts, which makes it difficult for scientists to study them in the lab under controlled conditions. For this reason, more is known about the development of the ectomycorrhizal symbiosis because the two partners can be grown independently. In both cases, there is evidence that the fungus can sense the presence of volatiles (CO2), or chemicals in plant root exudates which then initiates hyphal growth and branching (Martin et al., 2001). Conversely, chemical signals from mycorrhizea which are perceived by the plant have long been suspected (Kosuta et al., 2003) and only recently has the structure of one of these chemicals in the ecotmycorrhizal association been fully characterized (Maillet et al., 2011). The chemical signals are aptly called Myc-factors which, interestingly, are similar in structure to the nod factors produced by rhizobia in the rhizobia-legume symbiosis. It is still unclear whether the fungus produces the signals all the time or only when it senses the plant is near. Regardless, fungal spores in the soil remain in a resting state until one of these stimuli initiates germination and hyphal growth. If close to a root, hyphal growth and branching will increase and Myc-factors will initiate root branching presumably to improve the odds of root-fungus interception (Figure 5b). After making contact with the plant root, infection begins by either the formation of a hyphopodium (in arbuscular mycorrhizae) or growth between dermal cells (in ectomycorrhizea). If a root is not in the vicinity, the hyphae stops growing and the spore returns to a vegetative state; subsisting off of its triacylglyceride and glycogen reserves. Initiation of hyphal growth can occur multiple times until root interception is achieved. To capture nutrients for the plant, both the ecto- and endomycorrhizae extend hyphae centimeters into the soil resulting in a 10 fold increase in the effective root surface area and a 2-3 fold increase in the uptake of phosphorus (and other nutrients) per unit root length compared to non-mycorrhizal plants. It is not only the amount of hyphae that helps in nutrient acquisition, but also their small size (<200 mm) that enables them to access small soil pores and cracks that the plant root would otherwise not be able to access. The network of fungal hyphae emanating from the plant roots also has a tremendous impact on soil quality. The mycorrhizal hyphae promote soil aggregate formation and stability via biological, physical and biochemical mechanisms which reduces soil erosion and increases soil aeration and water infiltration, which together improves plant productivity (Rillig and Mummey, 2006). 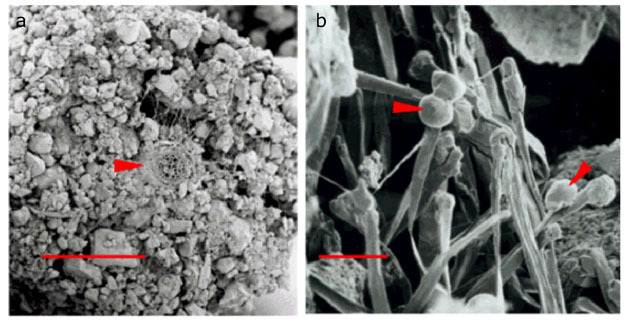 Interestingly, the dense, intertwined network of fungal hyphae forms a “common mycorrhizal network” (CMN), in which hyphae from mycorrhizae infecting two or more plants are interconnected. Through the CMN, plants have been shown to share nutrients and mediate the interactions between plants which are not immediately sharing the same space (Selosse, el. al., 2006). The diversity of these interactions and the mycorrhizal fungus taking part in them have been shown to have a great deal of influences on plant biodiversity, ecosystem function and stability (van der Heijden, et al., 1998). Plant growth promoting rhizobacteria were first defined by Kloepper and Schroth (1978) as organisms that, after being inoculated on seeds, could successfully colonize plant roots and positively enhance plant growth. To date, there have been over two dozen genera of nonpathogenic rhizobacteria identified. Plant growth promotion can be shown to work directly on the plant in the absence of root pathogens by the release of plant growth stimulating compounds (e.g. phytohormones such as auxins or cytokinins) and improvement in mineral uptake (e.g. siderophore release increasing Fe availability). Plant growth promotion can also occur indirectly by control of pathogens (biocontrol) via synthesis of antibiotics or secondary metabolite-mediated induced systemic resistance (ISR) (van Loon, et al., 1998, 2007). Microbial colonization of the plant root surface is not uniform, but instead occurs in patches along the root, ultimately covering ~15- 40% of the total plant root surface. The density and structure of the microbes on the root surface are dictated by nutrient availability and physicochemical variations throughout the root surface. Root exudates can serve as a food source and chemoattractant for microbes which then attach to the root surface and form microcolonies. Common sites for bacterial attachment and colonization are at epidermal cell junctions, root hairs, axial groves, cap cells, and sites of emerging lateral roots (Danhorn et al., 2007). Microcolonies can eventually grow into larger biofilms consisting of multiple layers of bacteria which are encased in an exopolymeric matrix (figure 5c). In many cases the effectiveness of rhizobacteria at promoting growth occurs in a density dependant manner (Rudrappa, et al., 2008). Once a critical microbial density is reached, the biofilms then begin to act in unison, in a process known as quorum sensing, coordinating the release of compounds that aid in the promotion of plant growth via the direct and indirect mechanism discussed previously. The spatial extent and influence of the rhizosphere are dictated by root system architecture (RSA) (Figure 2). Root system architecture is very malleable, determined by plant species and occurring in response to changing climactic, biological and edaphic conditions. The distribution of nutrients in soils is heterogeneous or patchy and there is evidence plants can “sense” the presence of nutrients and allocate more resources to the root system and direct root growth toward or within these patches (Figure 7). Examples include increased root depth in drought tolerant beans, wheat, and maize and an increase of dense shallow root systems leading to topsoil foraging for P in plants under low P conditions (Ho et al, 2005). The nutrients themselves and the activity of specific molecular pathways involved in their acquisition may act to induce hormonal signals triggering increases in root density and length (Lopez-Bucio et al., 2003). Because of the underground nature of plant roots, uncovering the mechanisms responsible for root foraging has been difficult, but full annotation of the Arabidopsis genome and a complete map of root cell types have dramatically increased our understanding of root biology and these processes (Malamy and Benfey, 1997; Dinneny, et al, 2008; Benfey et al, 2010). Changes in roots system architecture (RSA) of barely (Hordeum vulgare) in response to zones of high phosphate, nitrate, ammonium and potassium availability. © 2012 Nature Education Hodge, A. The plastic plant: root responses to heterogeneous supplies of nutrients. New Phytol 162, 9–24 (2004). All rights reserved. Roots serve many functions for a plant including anchorage and acquisition of vital nutrients and water necessary for growth. The plant root-soil interface is a dynamic region in which numerous biogeochemical processes take place driven by the physical activity, and the diversity of chemicals released by the plant root and mediated by soil microorganisms. In turn the processes occurring in this region control a host of reactions regulating terrestrial carbon and other element cycling that sustain plant growth and which have an enormous influence on plant and microbial community function and structure which greatly influence a variety of ecosystem level processes (van der Heijden et. al., 2008; Wardle, 2004; Berg and Smalla, 2009). Understanding and harnessing these interactions for the sustainable production of food, fuel and fiber to support a growing world population on a dwindling supply of arable land will be the challenge of generations to come. clay minerals – the chemical weathering products of rocks, composed principally of parallel silica sheets (phyllosilicates), that impart plasticity to soils and harden when dry. dicot – One of the two main divisions (the other being monocots) of flowering plants (i.e. angiosperms) which have two cotyledons or “seed leaves”. Examples include fruiting trees and most annual and perennial flowering plants. monocot – One of the two (the other being dicots) divisions of flowering plants (i.e. angiosperms) which have only one cotyledon (“seed leaf”) and parallel veins. The most common examples are grasses like corn, barley and wheat. redox – oxidation-reduction reactions are coupled reactions whereby one compound releases electrons (becoming oxidized) while another compound absorbs the electrons becoming reduced (Sylvia et al. 2005). The term “redox condition” refers to the environmental parameters controlling redox reactions (i.e. oxygen concentration, pH, temperature, and availability of terminal electron acceptors). Benfey, P.N., Bennett, M., Scheifelbein, J. Getting to the root of plant biology: impact of the Arabidopsis genome sequence on root research. The plant journal. 61:992-1000. (2010). Buchanan, B. B., Gruissem, W. & Jones, R. L. Biochemistry and Molecular Biology of Plants (Courier Companies Inc., U.S., 2001). Clark, F. E. Soil Micro-organisms and Plant Roots (1949). Dinneny JR, Long TA, Wang JY, Jung JW, Mace D, Pointer S, Barron C, Brady SM, Schiefelbein J, Benfey PN. Cell Identity Mediates the Response of Arabidopsis Roots to Abiotic Stress. (2008) Science. El-Morsy, E. M. Microfungi from the ectorhizosphere-rhizoplane zone of different halophytic plants from the Red Sea coast of Egypt. Mycologia 91: 228-236 (1999). Estermann, E. F. & McLaren, A. D. Contribution of rhizoplane organisms to the total capacity of plants to utilize organic nutrients. Plant and Soil 15, 243-260 (1961). Genre, A. and P. Bonfante (2007). “Check-In Procedures for Plant Cell Entry by Biotrophic Microbes.” Molecular Plant Microbe Interactions 20(9): 1023-1030. Handelsman, J. & Stabb, E. V. Biocontrol of soilborne plant pathogens. Plant Cell 8, 1855-1869 (1996). Hawes, M. C., Brigham, L. A., Wen, F., Woo, H. H. & Zhu, Z. Function of root border cells in plant health: Pioneers in the rhizosphere. Annual Review of Phytopathology 36, 311-327 (1998). Jones, D.L., Nguyen, C., and Finlay, R.D. Carbon flow in the rhizosphere: carbon trading at the soil-root interface. Plant Soil. 321:5-33 (2009). Kloepper, J. W., Schippers, B. & Bakker, P. A. H. M. Proposed Elimination of the Term Endorhizosphere. Phytopathology 82, 726-727 (1992a). Kloepper, J. W., Tuzun, S. & Kuc, J. A. Proposed Definitions Related to Induced Disease Resistance. Biocontrol Science and Technology 2, 349-351 (1992b). Knee, E. M. et al. Root mucilage from pea and its utilization by rhizosphere bacteria as a sole carbon source. Molecular Plant-Microbe Interactions 14, 775-784 (2001). Kosuta, S., Chabaud, M., Lougnon, G., Gough, C., Denarie, J., Barker, D.G., Becard, G. A diffusible factor from arbuscular mycorrhizal fungi induces symbiosis-specific MtENOED11 expression in roots of Medicago truncatula. Plant Physiol. 131:952-962 (2003). Leong, J. & Neilands, J. B. Mechanisms of siderophore iron transport in enteric bacteria. J. Bacteriol. 126, 823-830 (1976). Liu, L., Kloepper, J. W. & Tuzun, S. Induction of Systemic Resistance in Cucumber by Plant Growth-Promoting Rhizobacteria – Duration of Protection and Effect of Host-Resistance on Protection and Root Colonization. Phytopathology 85, 1064-1068 (1995). Lynch, J. in Experimental Microbial Ecology (eds. Burns, R. G. & Slater, J. H.) (Blackwell Scientific Publications 1982). Miller, M. B. & Bassler, B. L. Quorum Sensing in Bacteria. Annual Review of Microbiology 55, 165-199 (2001). Park, S. et al. Motion to Form a Quorum. Science 301, 188 (2003). Petrucci, R. H. General Chemistry (Macmillan Publishing Company, New York, New York, 1989). Pinton, R., Varanini, Z. & Paolo, N. The Rhizosphere: Biochemistry and Organic Substances at the Soil-Root Interface (CRC Press, Boca Raton, 2007). Raven, P. H., Evert, R. F. & Eichhorn, S. E. Biology of Plants (W.H. Freeman and Company Worth Publishers, New York, New York, 1999). Römheld, V. & Marschner, H. Evidence for a Specific Uptake System for Iron Phytosiderophores in Roots of Grasses. Plant Physiology 80, 175-180 (1986). Sylvia, D. M., Fuhrmann, J. J., Hartel, P. G. & Zuberer, D. A. Principles and Applications of Soil Microbiology (Pearson Prentice Hall, Upper Saddle River, New Jersey, 2005). Tilman, D., Cassman, K. G., Matson, P. A., Naylor, R. & Polasky, S. Agricultural sustainability and intensive production practices. Nature. 418, 671-677 (2002). van Loon, L.C. Plant responses to plant growth-promoting rhizobacteria. Eur. J. Plant Pathol. 119:243-254. (2007). Walker, T. S., Bais, H. P., Grotewold, E. & Vivanco, J. M. Root Exudation and Rhizosphere Biology. Plant Physiology 132, 44-51 (2003).